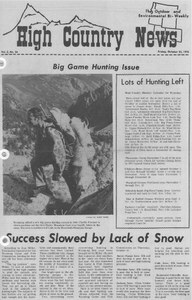 According to the Wyoming Game and Fish Commission, lack of snowfall in the high country has made hunting for deer and elk extremely tough. Wyoming's unspoiled countryside is in jeopardy. The vast coal and uranium deposits which lie beneath our prairies and deserts are a treasure house of energy. Rifle scabbards ... where and how? Big game hunters who use horses are often faced with a problem -- how to carry their rifle. Rifle scabbards hung on the saddle are a ready answer -- but where are how do you hang the scabbard?